Blaine M. Kolker graduated from Winston Churchill High School in Potomac, Maryland in 1981. There, he served as President of the Debate Team and qualified for national finals in both Lincoln Douglas debate and Student Congress. Blaine graduated from Syracuse University in 1985 with dual degrees in Operations Management and Management Information Systems. Blaine worked in the food industry while attending night school at the University of Maryland School of Law, from which he graduated in 1994. After being admitted to the Maryland Bar in 1994, Blaine began working representing injured clients. His career has been dedicated to fighting for the rights of persons injured by the negligence of others or in the course of their employment. 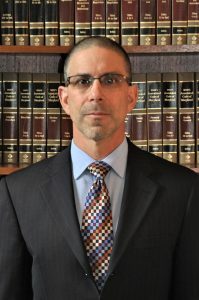 He has represented Plaintiffs in trial courts throughout Maryland and the District of Columbia and argued before the Maryland Court of Special Appeals. In addition, Blaine has over two decades of experience representing injured workers for claims in Maryland and the District of Columbia. Blaine is an exercise enthusiast and he has completed a number of marathons, triathlons and century bike rides. He enjoys golfing and spending time with his wife and three children.